Bavik. A true Belgian Pilsner, crafted by Brewery De Brabandere in Bavikhove, Belgium. This pilsner is uncompromised, brewed as it was in 1894. 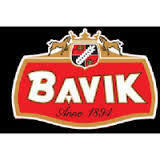 What makes Bavik a Super Pils?……. 100% MALT – No dilution assures the quality of the Pilsner. All ingredients are added during the brew process. 100% NOBLE BITTERNESS – By using only Aroma Hops there is a smooth bitterness with character leaving you with a soft and round aftertaste. 100% CRYSTAL CLEAR – 8 days of fermentation and 30 days of maturation guarantees a natural clarity and taste stability. 100% NATURAL FLAVOUR – Due to strict hygienic conditions we can avoid all heat treatment and bring you an unpasteurized Belgian pilsner with a unique flavor.